generators to be used in the solutions provided by WE Tech. The vessels are owned by the Finnish ship owner ESL Shipping Ltd., and built at Qingshan Shipyard of Sinotrans & CSC SBICO in China. ESL Shipping Ltd. is the leading carrier of dry bulk cargoes in the Baltic Sea region. 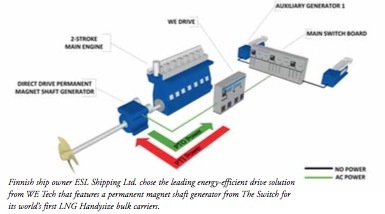 The ship owner chose PM shaft generator technology to support its sustainability strategy and start a new era in green shipping within pollution-sensitive seaways. These new, ice-class 1A ships will be the first LNG dual-fuelled Handysize bulk carriers in the world, representing the latest in technology and innovation. The aim of these new-build vessels is to raise the bar when it comes to energy efficiency and sustainability. Thanks to the focus on environmental benefits and cost savings that the advanced technology can provide, the vessels will also be more profitable for their owners. “With the active front-end low harmonic drive technology (WE DriveTM) and the permanent magnet shaft generator technology in our solution, the energy efficiency of the machinery reaches unmatched levels in the marine industry,” says Martin Andtfolk, sales manager of WE Tech. Using the Power Take Out (PTO) mode, WE DriveTM enables propulsion machinery to operate in combinator/variable speed while the direct-drive permanent magnet shaft generator produces electrical power up to 700kW for the vessel’s electrical network. Significant savings can be achieved by drastically decreasing the operating hours of the auxiliary generators, as well as reducing the need for maintenance. Using the Power Take In (PTI) mode, WE DriveTM converts auxiliary generator power to propulsion power by employing the direct-drive permanent magnet shaft generator as an electrical motor. The solution is utilized to boost the propulsion system with 1,250kW mechanical power when operating in demanding conditions. According to Mika Koli, business development manager from The Switch: “The market has now recognized that a PM shaft generator is the most energy-efficient way to generate power in a vessel.” The choice of The Switch PMM 1000 shaft generator, the most common type delivered to date, is very suitable for this type of bulk carrier vessel. It is installed directly on the propeller line and allows extremely high energy efficiency, especially in part loads. WE Tech is a leading energy efficiency solution provider with a global presence in the marine industry. The company specializes in supplying solutions based on variable frequency drives and permanent magnet machine technologies. Its portfolio of solutions provides many benefits for new builds and existing ship upgrades worldwide, including increasing energy efficiency, reducing fuel consumptions and lowering environmentally harmful emissions. The company is headquartered in Vaasa, Finland. The Switch, a Yaskawa company, is a pioneer in advanced drive train technology. The company has an installed base of over 11GW of megawatt-class permanent magnet machine and converter packages. The main focus areas are wind, marine and special industrial solutions. The company’s innovative drive trains make an impact on profitable power generation and energy use, with the ultimate goal of lowering the cost of energy and operations. Starting in 2006,The Switch reported net sales of €37.1 million in 2014. The company employs approximately 175 persons. The Switch is headquartered in Helsinki, Finland.